This page is a collection of links and summaries of oyster restoration efforts on a state-by-state basis and around the world. The sources on this page date back to 2009. If you have a project that should be included, please write to Tony Novak. A 2014 article in Nature Climate Change published online this week at nature.org gives insight into four ocean acidification hot zones affecting the shellfish. One is the mid-Atlantic region including the Delaware and Chesapeake bays. Although the whole problem will takes decades to control, the immediate focus of control measures in our region is on limiting nutrient runoff from agricultural operations. Samson Street Oyster House in Philadelphia is recycling its shells for future restoration efforts. Philly.com reports: "We live in the Delaware Bay estuary, we buy Delaware Bay oysters, we're selling them, then we're taking the byproduct - the shells, the waste, basically - and instead of it going to a landfill, we're putting it back into the bay to become reef for new oysters," Oyster House owner Sam Mink said. "For us, it's a win-win. It closes the loop and reduces our trash." The Delaware Bay Oyster Restoration Project, an ongoing effort to revitalize Eastern oysters in Delaware Bay, will be honored with a 2008 Coastal America Partnership Award. The Coastal America Partnership Award is the only environmental award of its kind given by the White House. The program has two objectives: to enhance survival by providing clean shell to which juvenile oysters can attach and grow, and to maintain the ecology of the bay by sustaining oyster reefs that would otherwise degrade over time due to natural processes. Young oysters grown by residents at their docks are transplanted to reefs. The Shuck and Share Oyster Recycling Project has recycled over 40,000 pounds of oyster shells from by 11 participating local restaurants. This web page also has links to the Mar Discover Center's volunteer activities. The City of Stuart partnered with Florida Oceanographic Society in the Treasure Coast Shell Recycling Program. This program collects discarded oyster, clam and mussel shells from restaurants and recycles them into the estuary to provide a habitat for new oysters. What is notable about this project is that shell is collected in 5 gallon buckets (we presume thousands of them are needed) that are collected weekly. The human labor requirement and the odor control factors if this program must be major considerations. Also, the article mentions that shell are only cleaned for "3 or more months" before deployment. Most other programs let shell sit for a year to remove the organic material before shell is recycled into estuaries. Fox News reports that the level of support for experiments to repopulate oysters in the 156 mile Indian River Lagoon has been overwhelming. Waterfront property owners signed up for classes as volunteers for the oyster restoration project. Recent deaths of hundreds of pelicans, manatees, and dolphins have been blamed on the poor water quality in the lagoon. Oyster restoration is seem as the means for improving water quality. The National Oceanic and Atmospheric Administration used volunteers to collect used oyster shells from coastal restaurants and place them on the shorelines of the Tolomato River. The oysters formed a man-made reef, which acts as a barrier between incoming waves from ships and boats, decreasing the wave’s energy before it hits the Wright’s Landing coastline. The cause of oysters die-off in bays near Pensacola remains unclear, but officials contend habitats must be replenished and then given time to rebuild a healthy population. There are no sign that dermo is harming oysters in East Bay. UCF biology professor Dr. Linda Walters and a team of students lay oyster mats, which is one of the ways to provide natural shoreline protection, at Turtle Mound in New Smyrna. The Oyster Reef Restoration Project has hit a milestone - more than 50 percent of the oyster reefs planned for installation in the St. Lucie Estuary have been completed. A cooperative effort of local waterfront homeowners, baby oyster spat from Florida Gulf Coast University and a $5,000 grant from the Texas-based Gulf of Mexico Foundation to pay for the supplies. 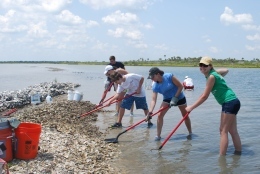 The Coastal Conservation Association and Georgia’s Department of Natural Resources spread bagged oyster shells along specific areas around Oatland Island in an effort to revitalize oyster populations. The project totaled 913 bags of oyster shells that totaled about 18,000 pounds. The Living Shoreline Restoration Project is designed to implement and study various techniques for stabilizing eroding habitat, with consideration to the natural ecology of Georgia’s coastal environment. One technique is the creation of oyster reefs. The project is funded in part by the National Oceanic and Atmospheric Administration and the Environmental Protection Agency. The Coalition to Restore Coastal Louisiana recently implemented the state’s first formal oyster shell recycling program to collect shell from New Orleans restaurants. The program is funded with a $1 million grant from Shell. Five ways for rebuilding oyster beds being used in Louisiana include 1)Oyster Cultch, 2) Oyster Hatchery, 3) Oyster Stock Budgets, 4)Traceability, and 5) Vessel Monitoring Program. 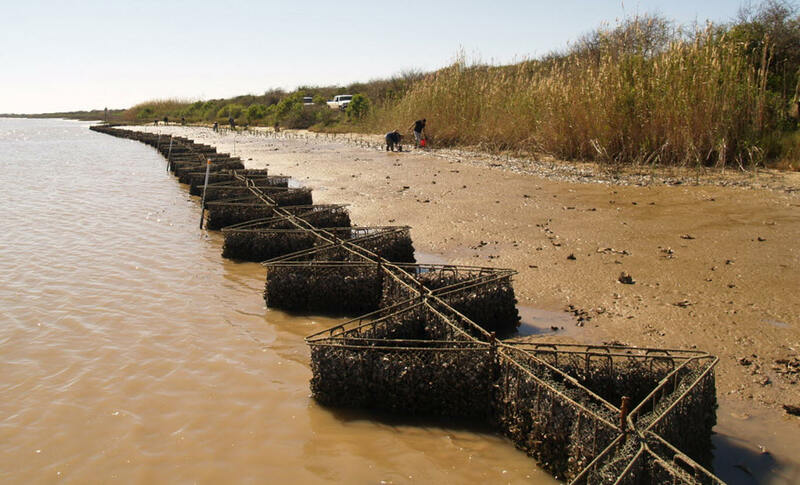 Oyster shell cages being used for erosion control. "A 12-person team of Nature Conservancy staff and volunteers, including eight DuPont employees, spent a Saturday morning fishing in the Bay of St. Louis in the Gulf of Mexico. The fishing expedition was a methodical research project designed to test the ecological benefits of a 15-acre oyster reef restoration site created by the Conservancy and the Mississippi Department of Marine Resources this spring. Using four boats, researchers fished for four hours on a rising tide, taking turns casting their rods on and off the reef. Results proved encouraging as 113 fish (including 69 white sea trout) were caught on the newly created oyster reef and 61 were caught off the reef. The report might have been distributed by The Nature Conservancy to local newspapers but we did not locate the original underlying report. This oyster gardening program is different from other oyster restoration projects because the oysters that are planted in Mobile Bay are about 3 inches. Planting the oysters in November after they have grown to that size makes them stronger and more likely to survive than oysters typically planted on reefs for restoration. The bigger oysters also will be able to spawn their first spring in the Bay, making even more oysters. The program is sponsored by Mississippi-Alabama Sea Grant, the Mobile Bay National Estuary Program, Auburn University and Alabama Cooperative Extension System. Deadman's Island is a thin strip of land located in Pensacola Bay is the victim of constant erosion, is a cultural and historical landmark in the area. Gulf Breeze city officials worked closely with state environment officials and Ecological Consulting Services, Inc. to draft the restoration project designed to stabilize the island and prevent it from disappearing. Maryland is buying over 112,000 tons of oyster shell from Florida at a price of $6.3 million and paying another $3 million to ship them by rail for use in rebuilding Chesapeake Bay oyster reefs. The shells will be used by Maryland Department of Natural Resources for reef building projects in Harris Creek and the Little Choptank River. Results of tests in the Choptank to rebuild oyster reefs that will revitalize the Chesapeake Bay are surprisingly better than expected. The study was the cooperative effort of various groups in Maryland and Virginia. Concrete rubble from the demolished dam on the Patapsco River was moved to a 2 acre site in the Chesapeake Bay where it will be seeded with 4 million oyster spat with the assistance of The Chesapeake Bay Foundation. Over the past decade, billions of oysters have been planted in the Chesapeake Bay, pushed off of boats by the thousands to settle on sanctuaries and managed reserves throughout the watershed but results have been impaired by several factors. Habitat degradation, disease and overharvesting have taken their toll on the native oyster, reducing its numbers to less than one percent of peak population. Governor O'Malley's oyster restoration plan. The state’s Marylanders Grow Oysters program is the newest opportunity for people to get involved in raising oysters at their piers. This year, volunteers are growing 1.5 million to 2.5 million oysters in 5,000 cages suspended from piers and docks. 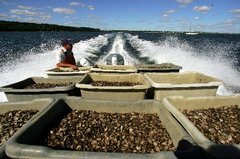 After the Potomac's public oyster grounds administered by the Potomac River Fisheries Commission have all but succumbed to a pair of oyster diseases and over harvesting, private growers on leased beds were able to restore oyster populations. Yields increased 10 times over last year after planting seed on leased grounds 3 years ago. The Federal Highway Administration has awarded its Exemplary Ecosystem Initiative Award to the Maryland Transportation Authority, the Department of Natural Resources, the Chesapeake Bay Foundation and other partners for creating the Asquith Creek Oyster Reef in the Severn River last fall. The 3-acre reef provides a sanctuary for 4 million juvenile oysters and was made from demolished concrete from the Bay Bridge Preservation Project. Its purpose is improving the Chesapeake Bay water quality and was done as part of the state's sustainable growth program, Smart, Green and Growing, created by Gov. Martin O'Malley last year. The state Department of Natural Resources employee delivers cages full of baby oysters to homeowners' piers in the community. Members of the Southern Maryland Oyster Cultivation Society and the Calvert Marine Museum recently deposited more than 200,000 oysters on test sites in the Mill Creek watershed. The test will help scientists identify locations most likely to support viable oyster communities. The Massachusetts Oyster Project is a non-profit oyster restoration program returning the water cleansing mollusks to the estuaries of Boston Harbor. Mark Faherty, science coordinator for Wellfleet Bay Wildlife Sanctuary, talked about the oyster habitat restoration project, now underway, which plans to restore wild oyster reefs on land owned by Mass. Audubon off Lieutenant Island. "We are testing three reef-building materials. ... And preliminary results indicate a high density of oyster set on the three experimental materials in July, 2009," he said. An important part of this collaborative effort that includes the involvement of riparian owners. In the backyard of a private home two 275-gallon seawater tanks serve as a nursery for young oysters. A similar system has operated in the Tisbury Great Pond for years with great success. While land-based oyster shell seeding and transplant programs are the norm in other areas, apparently this is new for Mississippi. The program is being tested by a commercial grower and then may be expanded to the public reefs by the state. The Oyster Conservationist program is sponsored by The Nature Conservancy and the University of New Hampshire. For the past nine years local residents have helped restore native oysters to the bay. The Nature Conservancy received a $24,000 grant from the New Hampshire Conservation License Plate Program to help rebuild an oyster reef at the mouth of the Squamscott River. 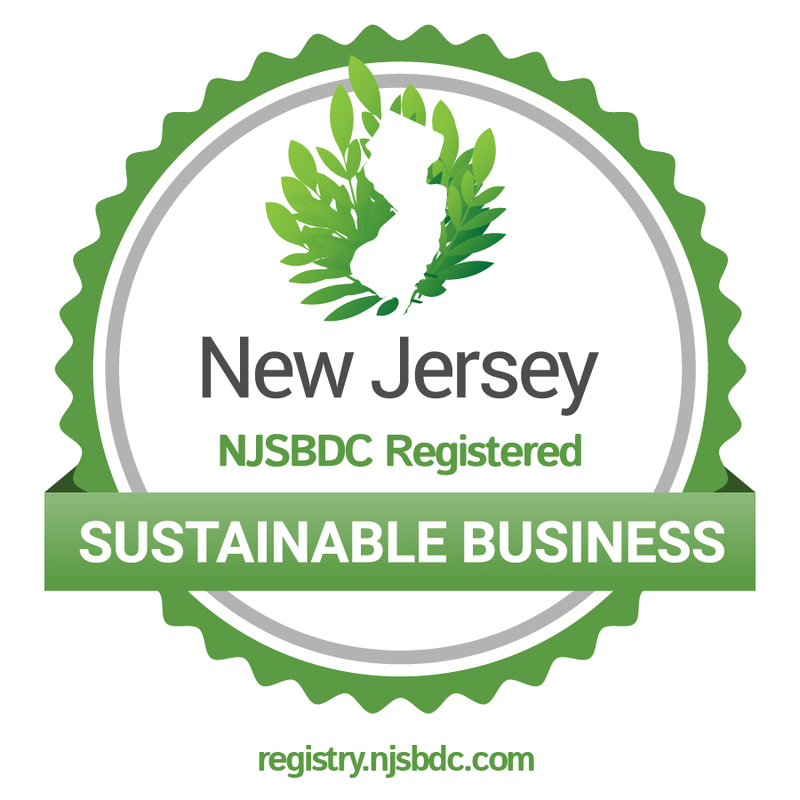 New Jersey legislators proposed legislation that would guarantee citizens the right to cultivate oyster gardens following a ban by the NJ Department of Environmental Protection in 2010. The bill's sponsor announced a resolution was reached between Baykeeper and the DEP pending final outcome of the proposed resolution. "Barnegat Bay is in trouble. Everyone can see that. And one study after another has confirmed it. Time is not on the side of those who would delay action. The bay generates an estimated $4.4 million in annual revenue from tourism and commercial fishing for Ocean County"
Rutgers research indicates malformed oyster tissue embedded with tumors, as well as unusually thin shells. A statement on "PCBs and dioxins stick to river bottom sediments and get taken up by shellfish, according to the U.S. Department of Health and Human Services" does not include reference to source detail. I was unable to find a source. The only result of a search on hhs.gov for "oyster + pcb" said "The presence of toxic chemicals in the aquatic environment leads to the potential for contamination of fish and shellfish. These chemicals include pesticides, other industrial chemicals such as polychlorinated biphenyls (PCB's) , heavy metals (such as lead, cadmium, and mercury), and petroleum hydrocarbons (emphasis added). Funding for 2011 program funding included the Delaware Bay section of New Jersey Shell Fisheries Council, in partnership with the New Jersey Department of Environmental Protection, the Delaware Shellfish Advisory Council, the Delaware Department of Natural Resources and Environmental Control, the Partnership for the Delaware Estuary, the U.S. Environmental Protection Agency, DuPont Clear into the Future, PSEG Nuclear and private donors including local restaurants. City looks for location to raise seed oysters in cages beneath city docks. The article "Growing oysters one volunteer at a time" about North Fork of Long Island is no longer available online. Research into the impact of underwater sounds on oyster larvae settlement rates being funded by the National Science Foundation. Previously, it was widely believed that settlement rates were primarily a function of tidal water flow rates. Hammocks Beach State Park Ranger Jake Vitak will give a presentation at 5:30 p.m. about the collaborative restoration project by the park and the N.C. Coastal Federation to preserve the oyster habitat at Jones Island. 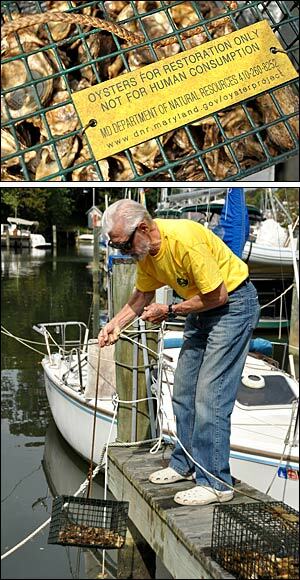 Pender Watch has an oyster shell recycle program in which people can drop off oyster shells to points at several other locations throughout the County. Pender Watch then holds a “shell bagging party” where volunteers come together to bag all the collected shells. A specially made mesh bag, environmentally friendly, is used to hold the shells. The reef building process can then begin. This a joint venture with the University of North Carolina Wilmington and Coastal Conservation Association of North Carolina. NCCF and the state's Coastal Reserve Program are sponsoring the work as part of a project to clean up debris from a former causeway on Permuda Island in Stump Sound. The N.C. Division of Water Resources is paying for the project, the release states. Volunteers will place about 1,000 bags of recycled oyster shells around the edge of an old causeway and plant over 2,500 marsh-plant seedlings along the shoreline. The shell bags will attract oyster larvae that will attach to the empty shells and start an oyster reef. Once planted the salt marsh seedlings will help stabilize the shoreline and restore marsh habitat in the project area. The Army Corp of Engineers completed an artificial reef 250 feet by 50 feet in Matagorda Bay to provide structure for oyster recruitment. Expanding on the amplifying effect of these projects, the article says "The reef could cultivate as many as 60 acres of oyster beds. Though a fraction of the size of the natural reefs found a century ago in the bay, new oyster beds could play a dramatic role in restoring the ecosystem." These families are experimenting with “oyster gardening” — using old shells to provide the hard surface upon which oyster larvae can attach and grow. This is one of several creative projects, paid by federal and state grants, under way to restore a small portion of the 8,000 acres of oyster reefs killed when Hurricane Ike buried them in sediment a year ago. Oysters are important to the Texas economy as a food and are also efficient filters that remove contaminants from the water as they feed. A single oyster filters 50 gallons a day. Reef restoration projects combined with the growing aquaculture business have created a shortage of oyster shells. A number of groups have come together to work out an oyster shell recycling program in the Richmond area. "The Chesapeake’s oyster reefs were destroyed by centuries of watermen towing rake like metal “dredges” and silted over by dirt flowing from the mid-Atlantic’s farms and growing cities. The final blow came in the mid-20th century: A pair of new diseases killed oysters by the millions. Now, in many places, the bay bottom is a flat expanse of green mud". My comments focused on the need to consider the environmental value of restoration as separate and distinct from commercial shellfish value and second, to clarify that "elevated Houses" refer to the artificial reef structure, not human's homes. Native oyster species were once vital ecosystem engineers, but their populations have collapsed worldwide because of overfishing and habitat destruction. In 2004, we initiated a vast (35-hectare) field experiment by constructing native oyster reefs of three types (high-relief, low-relief, and unrestored) in nine protected sanctuaries throughout the Great Wicomico River in Virginia, United States. Upon sampling in 2007 and 2009, we found a thriving metapopulation comprising 185 million oysters of various age classes. Oyster density was fourfold greater on high-relief than on low-relief reefs, explaining the failure of past attempts. Juvenile recruitment and reef accretion correlated with oyster density, facilitating reef development and population persistence. This reestablished metapopulation is the largest of any native oyster worldwide and validates ecological restoration of native oyster species. This report comes from the Department of Fisheries Science, Virginia Institute of Marine Science, The College of William and Mary, Gloucester Point, VA 23062, USA. The Chesapeake Bay Foundation wants more waterfront homeowners to take up oyster gardening. Primary source is Virginia Institute of Marine Science at the College of William and Mary. Scientists and watermen agree that oysters will grow in current dead zones. Also mentions past federal involvement in Virginia oyster restoration that later became a contentious issue.